ELASTIC HAIR TIES: Trendy Elastic Ponytail Holders Handmade with Fold Over Elastic. Tie Your Hair Back, It's HOT! • 10 - 500 Gold Glitter Hair Ties in Cellophane Bag. 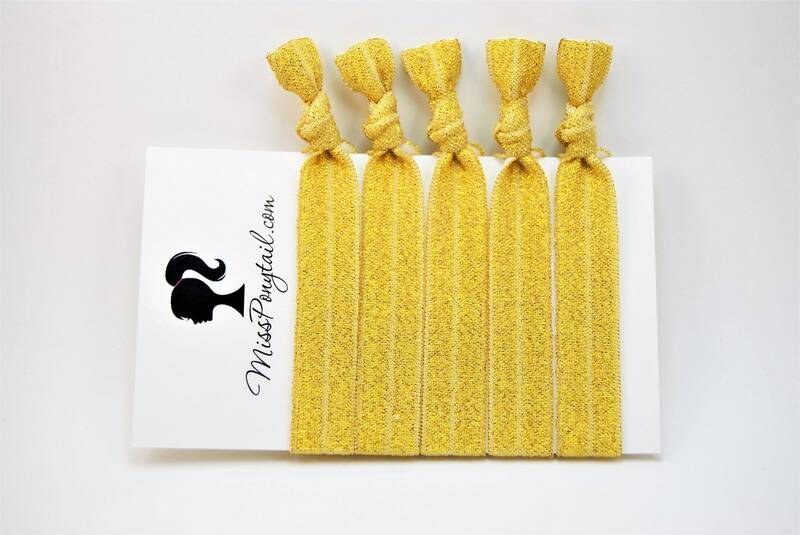 Our hair ties are perfectly stretchy and so soft! Can also be worn as a bracelet! Perfect gift idea. Perfect end of season gift for sports teams/cheer squads! Hair Tie Favors are such a fun addition to any party! They work for all hair types! Add a pack of hair ties to any girl gift! Measurements: approx. 5/8" wide and approx. 3" from knot to end. All Elastic Hair Ties are hand-knotted and sealed to prevent fraying. Colors may be slightly different than pictured due to screen settings. Perfect! Cute and just as shown in picture! Love this item! It’s great quality and packaged so cute and the seller is super nice and easy to work with! Exactly as promised. Thank you. What is the current processing time? We currently ship our in-stock Hair Ties within 48 hours of payment. We strive to give you the best customer service and get your package to you ASAP! We ship using USPS First Class mail, which takes about 2-5 days to be delivered. If you would like to upgrade to Priority, you will have that opportunity at checkout. If you spend $50 or more, you can use code FREESHIP50 to get Free Shipping! 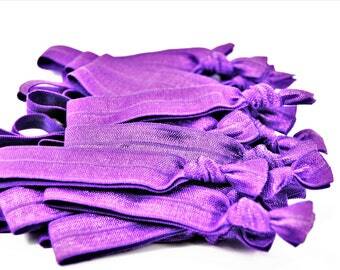 Our Hair Ties can be washed by hand with laundry detergent and lay flat to dry. When my hair ties get really dirty, I actually throw them into a small mesh bag with a zipper and add that in with my clothes in a cold wash, and also dry in dryer. Works great! Note: Some of the different prints can start to fade after awhile. We do offer wholesale/bulk options in our shop. Currently, we have listings for up to 5,000 Hair Ties, although we can accommodate larger orders. We offer Custom Printed Hair Ties! Any logo, design, phrase, etc will work! Minimum for custom orders is 100 Hair Ties. If you'd like to purchase a large quantity of Hair Tie Packs to sell, please message me for details. We do not print our own custom elastic, but we have an excellent elastic printer! Our custom printed hair ties are a wonderful fundraising or advertising idea. You can use them as promotional items for your business. Hair salons can hand out or sell hair ties with their own logo on them. Youth Sports teams can have matching hair ties and also sell them to raise money. We have a very low price per hair tie. Low cost marketing option!